Mayor Ramon T. Cabauatan Jr.
Bayombong is a first class municipality in the province of Nueva Vizcaya, Philippines. It is the capital of Nueva Vizcaya. According to the 2010 census, it has a population of 57,416 people. Bayombong is the seat of the Provincial Capitol of Nueva Vizcaya. The name Bayombong emanated from the Gaddang word “Bayongyong” which means confluence of two or more rivers. It has been reported that a certain tribe arrived and tried to invade the place, which caused the outbreak of the first tribal war in the area. The site was renamed “Bayumbung” as a sign of the Gaddangs' first victory in fighting for their private domains. The terrain is mountainous dominated by steep hills and mountains encompassing an area of 36.44% of its total land area. Level to gently sloping is 32.03%, rolling to hilly is 8.09% while the remaining 23.44% are very steep mountains. The town was founded at the juncture of the Calocool and Magat Rivers, and has grown to incorporate the Pan-Philippine Highway. Bayombong is politically subdivided into 25 barangays. It was in 1739 when Spanish Augustinian Friars named the place "Bayumbung", which was later changed into Bayombong. Bayombong was formally founded on June 12, 1739 during the first Mass celebrated in the region, officiated by Father Pedro Freire in a makeshift chapel at the foot of the Bangan Hill. Bayombong came under the administration of Dominican friars as a part of the Paniqui mission pueblo a few months after its founding. The pueblo census of 1747 records 470 residents of Bayombong. The names of those considered to be founding fathers of Bayombong were Ramon Cabauatan, Jacinto Gadingan, Vicente Saquing, Ignacio Abuag, Mariano Danao, Domingo Bayaua, a certain Bincatan and a certain Mamuric. All of them were Gaddangs. Their names are remembered today in major streets of the town. In 1754, the local government was formally organized. A Capitan del Pueblo was appointed as the chief executive. In 1982, the town became the seat of the new Diocese of Bayombong. From 1773–1792, Fray Juan Crespo constructed the brick St. Dominic's church, the convent and the cemetery next to the church, and started the octagonal tower. By 1829, Fray Juan Molano finished the tower. In 1880 the church building was damaged in an earthquake, while more than a century later, in 1987, a fire destroyed the church and convent. In 1989, the 250th anniversary of the first Mass in Bayombong, the rebuilt cathedral was dedicated. On 28 Nov. 1899 during the Philippine–American War, General Fernando Canon surrendered his 300-man battalion, plus 139 Spanish and 14 American prisoners, to 2nd Lt. James N. Munro's 53 men of the 4th Cavalry. Included in the release were William Rynders and Orrison Woodbury, captured with the rest of Lt. Gillmore's men during the Siege of Baler. In 1916, the American administration started a farm settlement school in Bayombong. In 1918, a high-school curriculum was added, and the school was named Bayombong Rural School. In 1928, Father de Gryse started St. Mary's, a Catholic elementary school. In 1930, Bayombong Rural School was re-purposed as Nueva Vizcaya Rural High School (NVRHS), and in 1934 St. Mary's added a high-school department. During the Japanese occupation, high school operations were suspended; they resumed in 1945. In 1947, the St. Mary's College (now St. Mary's University) was established by the CICM near the elementary and high-schools of the same name. 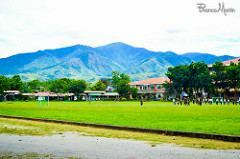 In 1956, NVRHS was converted into two programs: Nueva Vizcaya General Comprehensive High School and Nueva Vizcaya National Agricultural School. 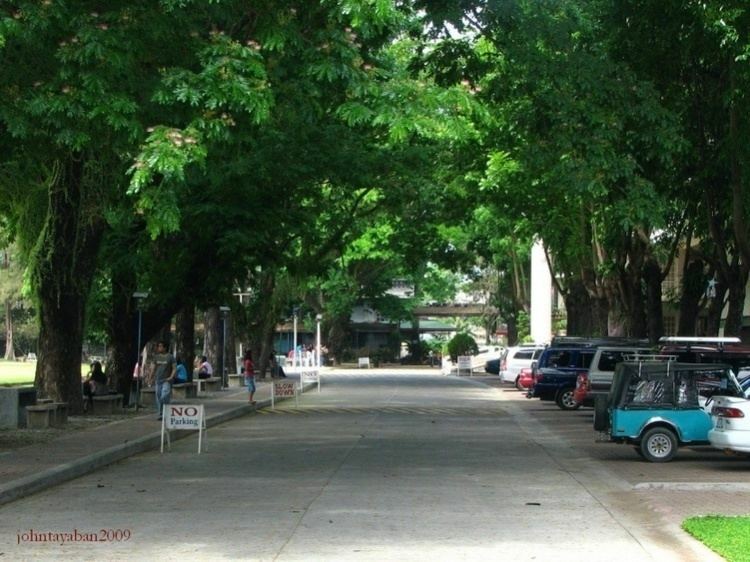 In 1964 the agricultural school became Nueva Vizcaya Agricultural College, then in 1973 Nueva Vizcaya State Institute of Technology. Presently, the school is Nueva Vizcaya State University. Bayombong is the 1913 birthplace of Roy Anthony Cutaran Bennett (1913–1990), editor of the Manila Bulletin who was tortured for his outspoken opposition to the Japanese occupation of the Philippines. Edith Lopez Tiempo, another Bayombong native, was celebrated as a National Artist of the Philippines in 1999. Ilocano, Bontoc, Gaddang, Ifugao, Isinay, Tagalog, and English are used always in Bayombong's schools, markets, and places of worship but in public schools they also use Ilocano. For fourteen (14) years from its founding in 1739, the town of Bayombong was administered by Friars. The major activities of the colonizers were Religion and Education. The year 1574 marked the beginning of the formal organization of the local government of Bayombong. With the appointment of a Capitan del Pueblo as the chief executive of the town. In 1789, the title of the chief executive was changed to Gobernadorcillo. In 1893, the title was changed to Capitan Municipal. During the government in 1896, the Presidente Local was chief executive of the town but this was again changed to Mayor in 1937 as per provision of the Commonwealth Constitution. Capitol Park – It is considered as the "Luneta of the North". This 8-hectare park is carpeted with green grass and elegantly landscaped. It has a boating lagoon, fountain and wishing well, picnic huts and sports facilities. It also has painting murals depicting some significant legends, the indigenous tribes and major attractions of the province. Bayombong Children's Park – located at the heart of the town and is a good playground of children. It is equipped with swings, slides, etc. St. Dominic Cathedral – It is located at the heart of the town and it boasts of having the best sounding church bells in the country. The structure is made of bricks and rare church antiques. The People's Museum and Library – This two-storey historical building, where the provincial government was formerly seated, is now housing the Novo Vizcayano history and heritage. Bangan Hill National Park – A historic landmark and cultural treasure. It is the site of the annual "Stations of the Cross" staged by the local Catholic church during the Lenten season using live actors depicting the last moments leading to Jesus Christ's crucifixion. Also great for hiking enthusiasts. Rizal Shrine – located at Barangay Casat, Bayombong. Bansing Falls – Located at Barangay Bansing, Bayombong, Nueva Vizcaya. Nueva Vizcaya Bright Child School, Inc.